THIS NEST FORMS BUSINESS USER AGREEMENT (THE “AGREEMENT”) IS A LEGAL AGREEMENT BETWEEN YOU, A PROSPECTIVE EMPLOYER, (“YOU” AND “YOUR”) WHICH ALLOWS YOU ACCESS FORMS CREATED ON THE NESTFORMS.COM WEBSITE USING NEST FORMS’S ON-LINE WEB-BASED FORM CREATION SERVICE (“SERVICE”). BY ACCESSING SUCH FORMS, YOU AGREE TO BE BOUND BY THESE TERMS AND CONDITIONS. 1.1 NEST FORMS shall grant you access to form data recorded by users of the app (“form data”) in accordance with the terms and conditions of this Agreement. To the extent that you may be required to download or install NEST FORMS’s software (the “Software”) for the purpose of accessing and viewing form data, NEST FORMS grants to you a non-exclusive, non-transferable, royalty fee licence of the Software for such purposes. 2.1 NEST FORMS is not responsible for the content of the form data (the “Content”) you access. You agree to use the Content solely for the purpose of vetting and assessing forms and for no other purpose. You agree that you are wholly responsible for your use of the Content, in particular, any decisions you may make about the suitability or otherwise of a job candidate for a job vacancy. You also agree to indemnify and hold NEST FORMS harmless from and against any liabilities, damages, judgements, losses, costs and expenses (including reasonable legal fees) arising out of any claims or allegations made by third parties (including, without limitation, disappointed job candidate applicants) against NEST FORMS concerning your use of the Content. (g) reproduce or retransmit the Content without NEST FORMS’s permission. 2.3 You hereby agree to indemnify and hold NEST FORMS and its licensors harmless from and against any liabilities, damages, judgments, losses, costs and expenses (including reasonable legal fees) arising out of your use of the Forms and the Content in a manner inconsistent with the terms and conditions of this Agreement. As the Service is being provided for free, NEST FORMS provides the Service on an “as is” basis and all implied conditions and warranties in respect of the Service are excluded by NEST FORMS to the fullest extent permitted by law, including without limitation, any conditions and warranties implied by the Sale of Goods Act 1983 and the Sale of Goods and Supply of Services act 1980. NEST FORMS also does not warrant that the Service will achieve any intended result or that your access to the Forms will be uninterrupted or error free. 4.1 Neither party’s liability to the other for fraud or for death or personal injury resulting from its own or its employees', agents’ or sub-contractors’ negligence shall be limited. 4.2 NEST FORMS accepts no responsibility and shall not be liable in contract, tort, breach of statutory duty or otherwise for any loss of profit, loss of data, business, revenue, goodwill, anticipated savings, or any indirect or consequential loss that may be suffered by you or any other person or company under or in connection with this Agreement. 4.3 Except as provided for in this clause 4, the aggregate liability of NEST FORMS to you arising out of or in connection with this Agreement, howsoever arising, in contract, tort (including negligence) or otherwise, shall not exceed, in aggregate, one thousand euro (€1000). 4..4 NEST FORMS shall be discharged from liability in respect of any claim brought by you more than one year after you had, or by the exercise of reasonable diligence should have had, knowledge of the occurrence that gives rise to such claim. In order to access and view the form data you will need to create a user name and password. You should keep this password safe at all times and should not disclose same to third parties. NEST FORMS accepts no responsibility for any unauthorised use of your user name or password. 6.1 This Agreement shall continue in force unless terminated hereunder, but will immediately expire in the event that you have not logged on to use the Service for a period of six months. 6.2 Either party may terminate this Agreement if the other breaches any of the terms of this Agreement and the breach cannot be remedied, or, if capable of remedied, is not remedied within thirty (30) days of receipt of written notice from the non-breaching party. 6.3 NEST FORMS may terminate this Agreement for any reason whatsoever by giving you seven day’s notice in writing. 6.4 Either party shall be entitled to terminate this Agreement without prejudice to its other rights and remedies forthwith by notice in writing to the other party, if the other party is unable to pay its debts as they fall due or enters into compulsory or voluntary liquidation (other than for the purpose of a bona fide reconstruction or amalgamation), or compounds with or convenes a meeting of its creditors, or has a receiver or manager, or administrative receiver or an administrator or examiner appointed over its assets, or ceases for any reason to carry on business. 6.5 Any termination of this Agreement pursuant to this Clause 6 shall be without prejudice to any other rights or remedies a party may be entitled to hereunder or at law and shall not affect any accrued rights or liabilities of either party nor the coming into or continuance in force of any provision hereof which is expressly or by implication intended to come into or continue in force on or after such termination. 6.6 However on termination of this Agreement, your right to access and view the form data and any licences granted to you under this Agreement shall immediately cease. Any notice required or permitted to be given by either party to the other under this Agreement shall be in writing and submitted by email to the email address that the other party has specified. Such notices shall be deemed to be delivered one hour after being sent unless the sending party receives a report or message indicating that the message is undeliverable. The waiver by either party of a breach or default of any of the provisions of this Agreement by the other party shall not be construed as a waiver of any succeeding breach of the same or other provisions of this Agreement, nor shall any delay or omission on the part of either party to exercise or avail itself of any right power or privilege that it has or may have hereunder operate as a waiver of any breach or default by the other party. 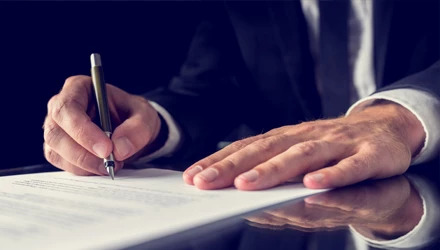 This Agreement supersedes all prior agreements, arrangements and understandings between the parties and constitutes the entire agreement between the parties relating to its subject matter. NEST FORMS reserves the right, at its sole discretion, to amend, add or delete any of the terms and conditions of this Agreement when the Service is upgraded and you should check this Agreement on NEST FORMS’s website regularly for all such changes. By continuing to access and view the Forms, you will have indicated your acceptance of any revised Terms. You shall not assign or otherwise transfer this Agreement or any of its rights or obligations hereunder whether in whole or in part without the prior written consent of NEST FORMS. NEST FORMS shall be entitled to assign and transfer all or any of its rights and obligations hereunder on notice to you and such assignee or transferee shall be entitled to enforce the same against you as if it were named in this Agreement as NEST FORMS. If any provision of this Agreement shall be found by any court or administrative body of competent jurisdiction to be invalid or unenforceable the invalidity or unenforceability of such provision shall not affect the other provisions of this Agreement and all provisions not affected by such invalidity or unenforceability shall remain in full force and effect. The parties hereby agree to attempt to substitute for any invalid or unenforceable provision a valid or enforceable provision which achieves to the greatest extent possible the economic, legal and commercial objectives of the invalid or unenforceable provision. NEST FORMS processes personal data in the context of providing the Service as a data processor only and will comply with its obligations as a data processor under the Data Protection Act, 1988 (as amended by the Data Protection (Amendment) Act, 2003) in respect of such processing. This Agreement will be governed and construed in accordance with the laws of Ireland, and you hereby agree that for the benefit of NEST FORMS and without prejudice to the right of NEST FORMS to take proceedings before any other court of competent jurisdiction, that the courts of Ireland shall have jurisdiction to hear and determine any suit, action or proceedings that might arise out of or in connection with this Agreement and for such purposes you irrevocably submit to the jurisdiction of such courts.